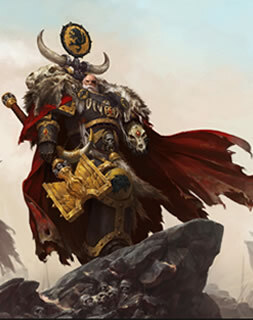 Ulrik the Slayer is the Wolf High Priest of the Space Wolves and has been mentor to some of the greatest leaders the Space Wolves Chapter has ever seen. Ulrik gained the name ‘slayer’ during the first war for Armageddon, as one of Lord Kruger’s Wolf Guard. As Lord Kruger was cut down by Khorne Bezerkers, Ulrik leapt to defend his dying Wolf Lord and butchered them all, earning himself the name ‘slayer’ and receiving a grim salute from the lord of the World Eaters. Once the battle was over the remaining Wolf Guard elected Ulrik to be Kruger’s replacement and become the next Wolf Lord. Astonishingly, Ulrik turned the honour down. Instead he accepted the rank of Wolf Priest and applied his centuries of martial experience to the selection and training of new recruits. In recent years however, Ulrik has become ever more aggressive on the battlefield, swearing great oaths to cut down the most deadly of enemies in the name of Russ and the Emperor without a care for his own safety. But in game terms Ulrik the Slayer is a Wolf Priest who not only improves the close combat abilities of the unit he joins, his improved stat line means he’s no slouch in close combat either. Much like Saga of the Beast Slayer, Ulrik has a special version of the Wolf Priest Oath of War ability. In this case he and any unit he joins which allocated their attacks to a model of Toughness 5 or higher may reroll to hit and reroll to wound. 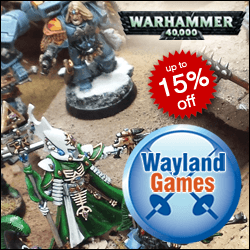 While this is great for hacking your way through Necron Elites, Plague Marines or Bikers, it also means that you don’t get the flexibility offered by the regular Wolf Priest Oath of War. This allows you to give 1 model in the army +1WS so long as they’re not a special character. It’s a nice way of giving a close combat specialist a bit of a boost. Really you’re looking to promote a WS4 model up to WS5, because then they’re more likely to be hitting on 3+. This would be wasted on characters who are likely to have a Wolf Tooth Necklace anyway. Instead I’d give the upgrade to a regular Wolf Guard with a Powerfist leading a Grey Hunter pack. That way you can make sure that his Power Fist scores as many hits as possible. Any Space Wolves unit that can trace a line to Ulrik may reroll failed morale tests, which is nice, but nothing something you can really plan a strategy around. Meanwhile any enemy Independent Characters attacking Ulrik in close combat must pass a Leadership test to attack. Once again, this is nice if it happens, but it’s not something that can be relied upon as most Independent Characters have good Leadership values. That said, a powerful character failing the test will give you something to laugh about! While some people like to run combi-weapon spam Wolf Guard units, I don’t feel that they’re very cost effective. Combi-weapon spam Wolf Guard Terminators on the other hand are pretty good. Mine also ride in a Land Raider to get them to where they are needed quickly and to take out a particular target. When you add Ulrik the Slayer, these Terminators become even better at hunting the big and tough stuff that typically needs a lot of combi-weapons and a couple of powerfists to kill it. Ulrik’s Slayer Oath allows them to re-roll to hit and re-roll to wound anything with Toughness 5 -and that’s exactly the kind of enemy units this squad is designed to hunt down. Ulrik simply makes them much better at it, which is great when they have a tendency to get bogged down in close combat if things don’t go well for them. However, to fit Ulrik in we can either boot a Wolf Guard out of the Land Raider or take a Redeemer over the standard Land Raider. I’ve often said that Space Wolves need all the lascannons they can get, but there’s no denying the awesome power of the Redeemer’s flamestorm cannons. The best way to run Blood Claws is to have a Wolf Priest leading them, because his oath of War gives them Preferred Enemy against a particular unit type chosen at the start of the game. Ulrik’s Slayer Oath however, only allows them to reroll to hit and reroll to wound against enemies with a Toughness of 5 or above. In this loadout we’ve swapped our regular Wolf Priest for Ulrik. You can still run these across the board and into the carnage of close combat. However, you’ll probably go for Toughness 5 models as a priority instead of simply attacking the nearest unit. Still, a savvy opponent could deny you getting near anything with Toughness 5, making Ulrik’s Slayer Oath useless. Similarly, Ulrik has the same issues leading Grey Hunters. 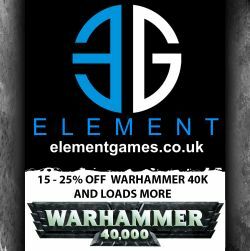 Due to their midfield role, you’re not very likely to get to choose exactly what you charge -unless you pack them all into a Land Raider of course. But when the best configuration is 7 Grey Hunters and a Wolf Guard in a Rhino and you have three units of these, it’s almost impossible to know which squad to put Ulrik in or where he’ll end up by the end of the battle. As before, a savvy opponent can just keep his Toughness 5 units well away from you. Brave as my Long Fang pack leaders might be in close combat, there really are no benefits from attaching Ulrik the Slayer to Long Fangs when his Slayer Oath only works in close combat. For 80pts more than a regular Wolf Priest, you get a Character with I5 who is a little better in close combat and gives you an extra boost against anything with Toughness 5. This makes him awesome when leading units which are designated monster hunters, like the Wolf Guard Terminators. But a regular Wolf Priest is just so much more versatile. And that’s the whole point of a Wolf Priest, to augment the unit he’s leading. Unfortunately, Ulrik only does this in very specific circumstances and for many Space Wolves armies a regular Wolf Priest will be a much better choice. So whether you use Ulrik or not really comes down to how many Toughness 5 units you’re likely to face. That’s generally Necron Elites, Plague Marines and Bikers, which means if Toughness 5 units become more common, then he is definitely worth taking.